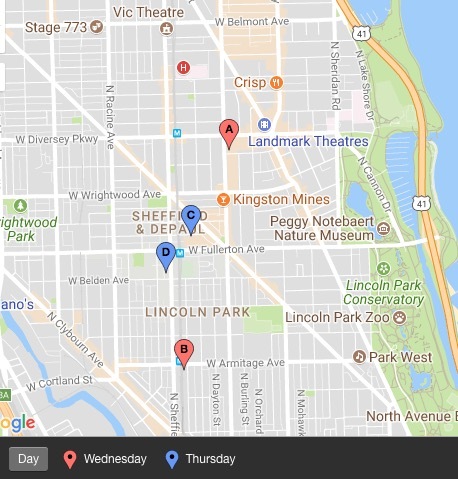 Two more robberies were reported in Lincoln Park Thursday evening, bringing this week’s mugging total to at least five, according to police reports. The latest muggings were reported three blocks apart on or near the DePaul University campus. Locations of four robberies reported in Lincoln Park since Wednesday. Police are particularly concerned about two men who robbed and then groped a woman in the 900 block of West Montana. The woman was approached by two men who announced a robbery shortly after 10 p.m. One of the men stood with his hands in his pockets while the other took the woman’s wallet and phone, then grabbed her in a sexual manner, according to police. Both suspects are black men who wore black hats with dark clothing. One of the men is over 6-feet tall while the other is much shorter—perhaps only 5’3” tall, the victim said. They were last seen going northbound on Sheffield from Montana. Around 9 p.m., a man was beaten up and robbed by two offenders in front of his apartment building in the 1000 block of West Belden. No offender information was available. On Wednesday, two people were mugged just minutes apart in Lincoln Park. A woman was held-up at gunpoint by two men and one woman in the 700 block of West Schubert around 1:56 a.m. A witness reported that the offenders unleashed a 30-second beating on the victim, punching her up to 10 times and kicking her repeatedly after she fell to the pavement. Separately, passers-by called 911 for a man who was found “all cut up and bleeding” after he was robbed by four offenders in the 1900 block of North Bissell. Monday, two women robbed a man in the 600 block of West Wrightwood around 2:30 a.m., according to a report. The offenders fled the area in a gray Ford Escape that was last seen heading northbound on Clark and then westbound on Diversey.